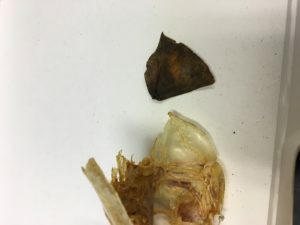 It’s official… the fish skeletal material recovered from the Saint’s Rest privy, the toilet associated with the first dormitory on campus contained walleye! 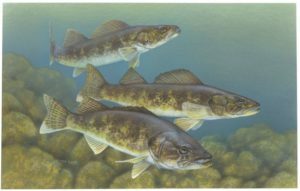 Walleye are the largest member of the perch family and can be caught in shallow bays and inland lakes. 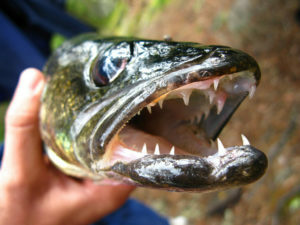 As there are plenty of inland lakes surrounding East Lansing, it is possible that these fish were caught locally and served on campus. Also, walleye actively feed all year round, they can be caught during any season, however, it is easier to catch them during the early morning and evening, as that is their prime feeding times (MI DNR). When the privy was excavated, an immense amount of bone was recovered from the southwest corner. The bones were very densely packed, and excavators were under time constraints so the area was block lifted and screened back at the lab! 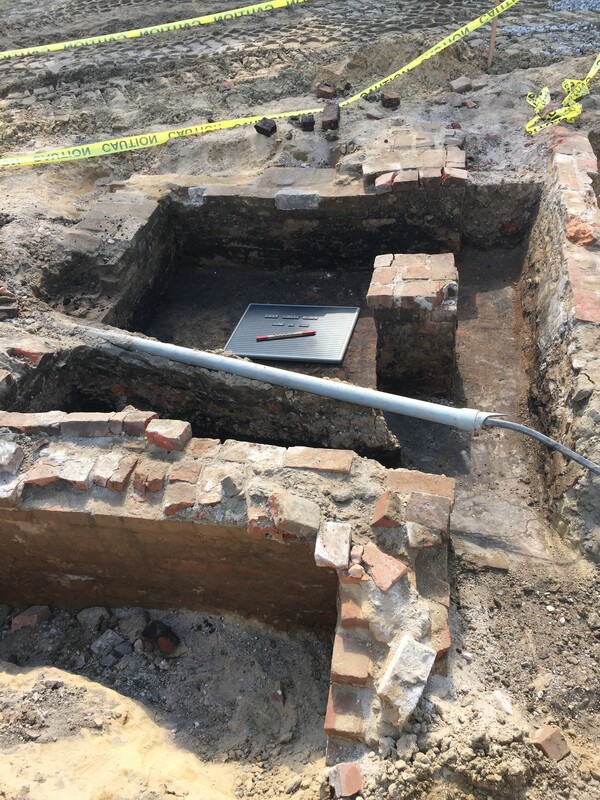 West Circle Privy after excavation. 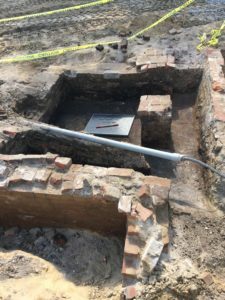 This privy was a permanent brick structure, a earth-closet type of privy, which means that it would have been cleaned out regularly, which may explain why the fish remains were packed tightly into the back corner, possibly out of reach as a result of the cleaning process. So how do I know that they are walleye? To determine which species the fish remains were, I began at the MSU Museum, where in the collections is a small fish index. This has many different bone elements separated out and labeled by species. This allowed me to get a preliminary identification of walleye or sauger. However, as the index does not include every single fish bone, I wanted further verification. Luckily for me, Dr. Terrance Martin (Illinois State Museum, emeritus) was visiting MSU and was able to take a few minutes and look at the Saints Rest privy fish remains. He also agreed that they looked like walleye, but suggested that I verify the remainder of the materials against other walleye specimens. Unfortunately, the MSU Museum did not have any other walleye skeletal materials in the collections so I turned to another museum. This past week, a specimen loan from the Field Museum arrived, allowing me to take the material and confirm that it is in fact walleye! 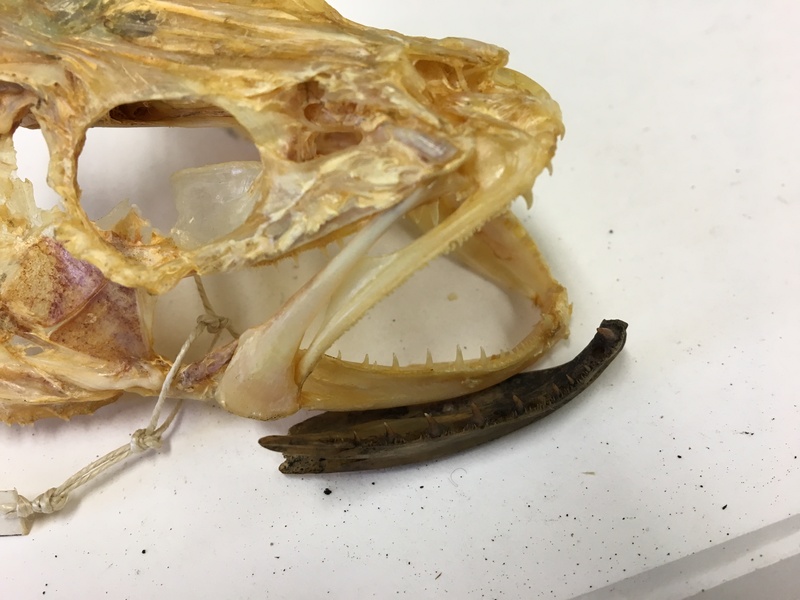 Below are some images of the fish remains, in comparison to the walleye specimen. Now that I have many of the previously identified elements confirmed as walleye, I am going to move forward on identifying the remainder of the fish remains, as I already have them sorted by side, counted, and weighed. In addition to focusing on the fish materials, I will begin looking through the mammal remains that have been uncovered on campus, including cow, pig, and sheep/goat with the goal of determining what type of meat cuts were present, and the proportions of species present within the archaeological contexts. Stay tuned for more updates on the Campus Archaeology animal bone identifications! Autumn Beyer is a second year Ph.D. student in the Department of Anthropology. Her research focuses on prehistoric foodways through the analysis of animal bones in the Midwestern United States. This is her first year as a CAP fellow and she plans on working with returning fellow Susan Kooiman on a project to recreate historic MSU meals based on artifacts recovered from a privy.